The psych-rock-dance band plays The Waiting Room Oct. 16. 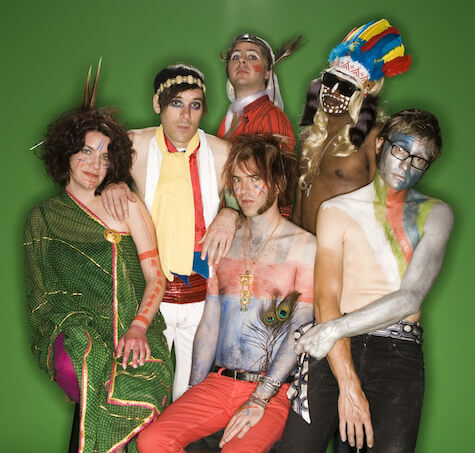 Of Montreal has made Omaha a regular tour stop for well over a decade. If you’ve kept track of the band you know their early-days home-made theatrics have evolved into grandiose, eye-popping extravaganzas that can compete with Flaming Lips for over-the-top stage dominance. We’re talking lights, costumes, props and numerous stage extras (actors?) living out the songs in weird, wonderful ways. It’s a spectacular spectacle that David Bowie surely would have approved of. The band returns supporting its latest album, Innocence Reaches (2016, Polyvinyl), that finds Kevin Barnes and Co. mining EDM territory but with quaint electronics and beats reminiscent of Pet Shop Boys. The thread that runs through it and all Of Montreal records is Barnes’ quirky melodies and trademark vocal croon that sounds like an alien computer singing lullabies to its robot children. We caught up with Barnes and asked him to take our Ten Questions survey. Eureka, California, It was Cinco de Mayo many years ago at a sports bar, no one knew who we were and everyone seemed intensely stupid and openly hostile. One person spent most of our show standing in front of our bass player and giving her the middle finger. 8. How do you pay your bills? I’d like to become a sports writer and cover boxing matches for a newspaper. I’d hate to be the judge at any kind of food eating competition. I’ve heard that it smells of manure and that it’s rich in precious jewels.